^I feel the same way. I quite like to draw blokes in dresses just for the sake of fashion. You'd be surprised how masculine a 'dress' can be, if you do it right -- garments similar to what we call dresses were traditional men's dress in many places throughout history. i don't check the thread for a while and here you are talking about my favourite thing!! i think i'm getting a crush, too, ohno. ^Me too. Also women in drag. Basically, I just love androgynous-looking people. nothing has ever described me more. John was attracted to Yoko because he thought she looked like a “bloke in drag.” He loved men in drag. "Maybe I'm amazed at the way you pulled me out of time and hung me on a line"
Paul has said that he was drinking heavily at one point, and alcoholics sometimes refer to "drying out" when they kick (or significanly reduce) their habit. So the analogy of drying out on a line maybe makes some kind of sense in that respect. Ahhhhhh that makes sense, Richard. That did cross my mind after I drew it, when I saw him dripping like a soddy drunk. Wow, these just get better, don't they? I think wrung-out Paul is my favourite of your efforts yet! Wonderful. You are truly the Klaus Voorman of the Plastic Ono Beatlesbible Band! I must admit, Klaus is a bit of a role model to me. Ooh, I'd love to see you do something in the style of the Revolver cover! Included are one or more references to every song on the album, more or less -- though some are kind of (very) obscure. I'll notate them later when I have more time and you've had a chance to guess at them. I got I'm Only Sleeping , Yellow Submarine and Doctor Robert , but I'm not sure about the others. I see Father Mackenzie darning his socks for Eleanor Rigby and a big shining sun for Good Day Sunshine . And Alan Civil playing French horn for For No One . is that french horn for For No One ? A BIRD ON PAUL'S EAR FOR AND YOUR BID CAN SING! WOWIE. Maybe the little guy in Paul's ear is a reference to She Said She Said , "who put all those things in your head..."
Also, I see a hand reaching for some marijuana... could that be Got To Get You Into My Life ? Under spoiler. You're free to ignore them and keep guessing if you like, though I think most of them have been guessed already...? 13. Got To Get You Into My Life : It's a paean to pot, so I put marijuana leaves just next to the Sub. I was running out of ideas. 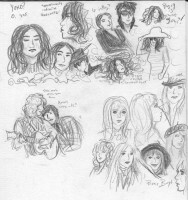 ALSO: Pattie Boyd is just under Eleanor Rigby 's face, and Klaus Voormann and Astrid Kircherr are just above Father MacKenzie. The Bowies look like they could be in a book. And I love the kitty and the lyrics. AHHHHHH both of those are so amazing!! !